The Book of Shadows is a combination cookbook and journal. In it you record your magical workings, the ingredients and methods you used, and how it worked. In this way you are able to learn from your magical experiences and build upon the successes you have. Over the course of time you add various information you acquire from other people, books, coven work and other sources and the book becomes a valuable reference.. It can be a spiral notebook, or an embossed calf hide bound collection of calligraphy on parchment, it’s up to you.. Traditionally the Book of Shadows or Grimoire was the record of magical workings of a witch or coven which would eventually be passed down to an apprentice or younger coven member when the writer retired or died. A special code was often used and the older books are notorious for the details that were omitted in the writing. It was often impossible to recreate the results based solely on what was written, one must have been trained to understand it. This may have served its purpose when magic was a secret known only to a few, but it no longer does. It pays to be thorough in writing your book so that you, or someone you allow to use it, can replicate the results if need be at a future date. What good does it do to create something if you cannot ever reproduce it or tell another how to make it. Be as organized as you want to be, set up the book in any way you like, write as often or as rarely as you see fit, but do write in it. Write what you learn from others, write what you try yourself, write things you see in books, it will all come in handy at some point. You may decide that you don’t want a physical book, keep your writings on your hard drive if you prefer a disk of shadows a DOS. Save a copy of that great incantation you saw on that webpage into your DOS, whatever works for you. The book, or file, will be as useful as you allow it to be. There are a number of of Shadows online that you might be interested in looking at for the ideas they contain. They have a number of other materials that you may be interested in as well, they include a number of rituals, articles on various subjects and spells with which to augment your BOS. There is information on the basics of Wicca, seasonal rituals and other information. A great resource for mythology, ritual and other interesting material is the Biblioteca Arcana. The Alexandrian BOS is online at Alexandrian BOS. Take advantage of some of these resources to add to your BOS, there’s something for everyone. Internet mail lists are another good source of material to add to your BOS. There are a huge number of them out there. Try Yahoo groups a major email group provider, or MSN Groups. Search for Wicca, Spells, Witchcraft and similar terms to find groups that will be useful. Also, check your favorite website; many have their own mailing lists available. Materials on these lists may be used to build your BOS. 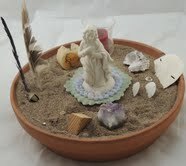 You can find chants, incantations, spells, recipes and the like. This is a good place to trade information with other witches as well. You will use your BOS/DOS for many many things.. I use my DOS for these articles and for 2 other articles I write. You will have valuable information that will guide you and help you do everything from write a ritual to create a sleepy time chant for you child..